It’s the beginning of our South Florida winter and you have no idea how exciting that is. Okay, we don’t really have four seasons, we have two; there’s a hot, humid and wet season, and then there’s a warm, clear and dry season. As I sit here, the air is dry, the temperature is in the mid 80’s, the sky is clear…and I’m wondering why the heck I’m inside with you instead of outside enjoying the perfect day! Just joking! Yes indeed I’d rather be here with you…Forget you pretty blue sky! You know what else I’d rather be doing? Eating these Asian Lettuce Wraps aaall over again! 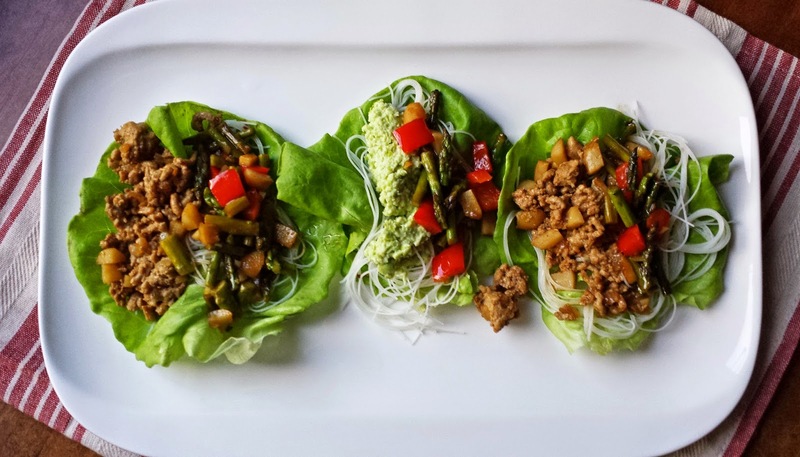 Lettuce wraps are like Asian tacos, and they are all about the filling! There are no pesky tortillas to fill up your belly so you can eat like a dozen lettuce wraps and not feel stuffed when ya get up from the table. Actually, I love tortillas, especially when they’re Handmade Tortillas, but there’s a time and a place for tortillas, and this is neither the time nor the place! The recipe instructions call for cooking the turkey and veggies in the same skillet. But for us; Billy eats meat, and I don’t; so I get two skillets on the cook top and stir-fry the vegetables and the ground turkey separately, dividing the onion, garlic, water chestnuts and sauce between the two pans. 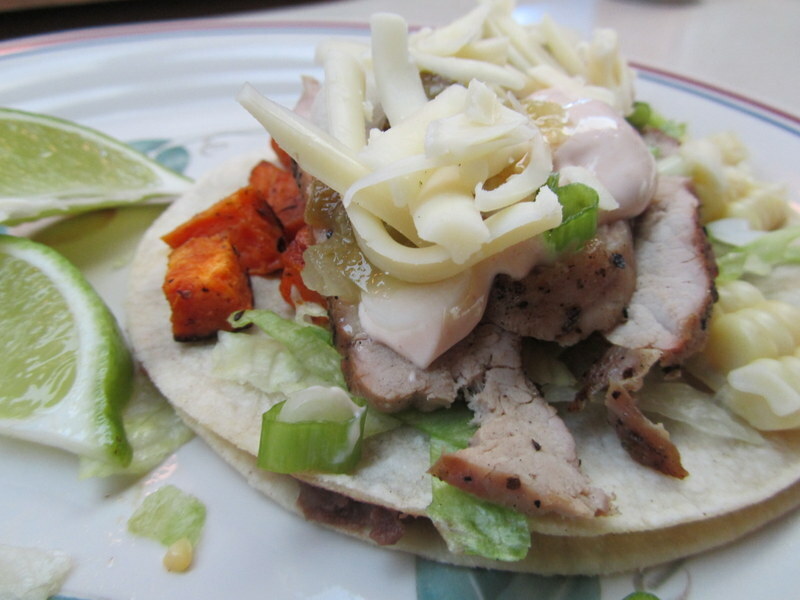 I used turkey in this instance, but the recipe works equally well with any ground meat. This time, for the vegetarian version I used Edamame Hummus that I had leftover, and had I not had that, I’d have added plain edamame to the veggies. I love the contrast of cool crisp lettuce, to the warm savory filling. I also love that because the “tortilla shell” is lettuce you’re eating your salad and entrée all at one time; two birds with one stone! I can no longer resist, the bright blue sky is beckoning me and it just won't quit (I probably shouldn't have put my desk in the window if I wanted to get any work done) so go I must! Thanks for hanging with me y'all! 1. In a small bowl whisk together the Hoisin sauce, rice vinegar, rice cooking wine, and toasted sesame oil; put that sauce to the side. 2. Coat the bottom of a large skillet with about 2 teaspoons of the grape seed oil and add the ground turkey to the skillet; cook over medium-high heat until the turkey has browned and cooked through. Remove the turkey to a bowl. 3. Return the skillet to the heat and add the remaining grape seed oil, add the onion and cook stirring for about a minute, until the onion is soft. To the onions add the garlic, asparagus, and bell pepper, cook while stirring for about another minute, until the veggies begin to soften. Add the browned turkey, water chestnuts and the sauce that was mixed in step 1. Stir and cook for a couple of minutes until the veggies are cooked to your liking. Remove to a serving bowl. 2. Fill the lettuce leaves with the turkey filling and rice noodles and enjoy them like an Asian taco (it's best to use two leaves per taco)! 1. Put the rice noodles into a large bowl and cover with boiling water. Allow the noodles to soak for 2 to 4 minutes, until soft. Drain the noodles well and return them to the bowl. Toss the noodles with the vinegar, sesame oil and crushed red chili pepper. 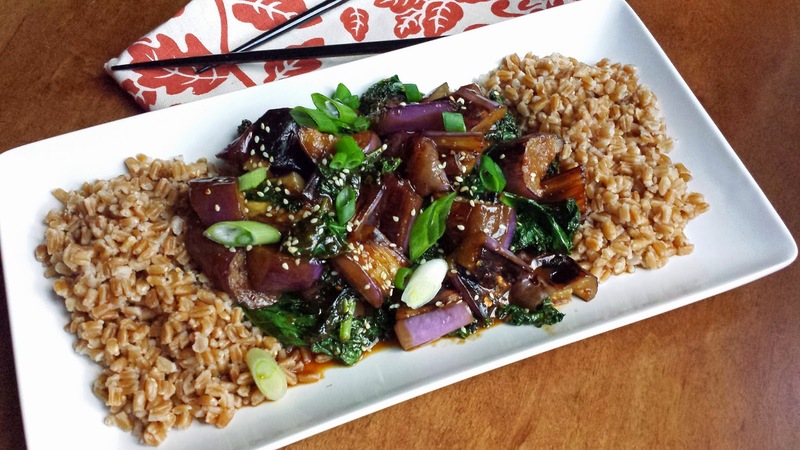 Note: *To make these vegetarian, omit the turkey, and reduce the ingredients for the sauce in half, also only use half of the water chestnuts. 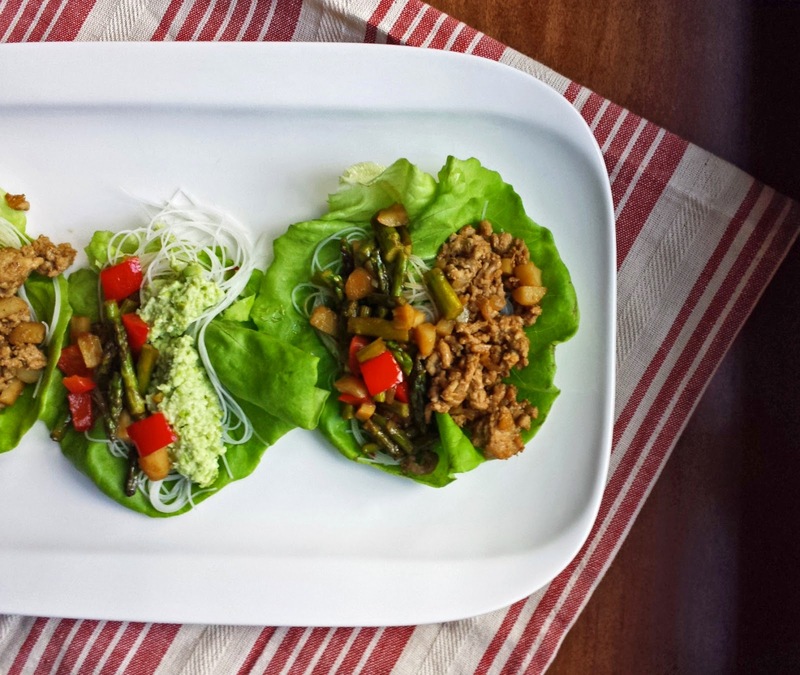 Fill the lettuce cups with the veggie mixture, noodles and Edamame Hummus. Yaaay! So happy to hear you've entered your "winter" 80s sounds like the perfect temp. It's been sooooo chilly here, so I could borrow some of that warmth. Love these Asian lettuce wraps. I could eat them all day long as well! Hope you had a marvelous weekend! 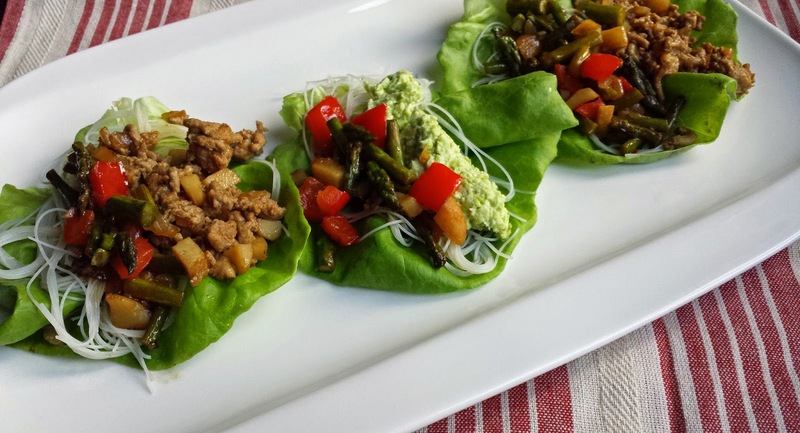 These lettuce wraps look so refreshing! I am jealous that you can still get green asparagus at this time of year. 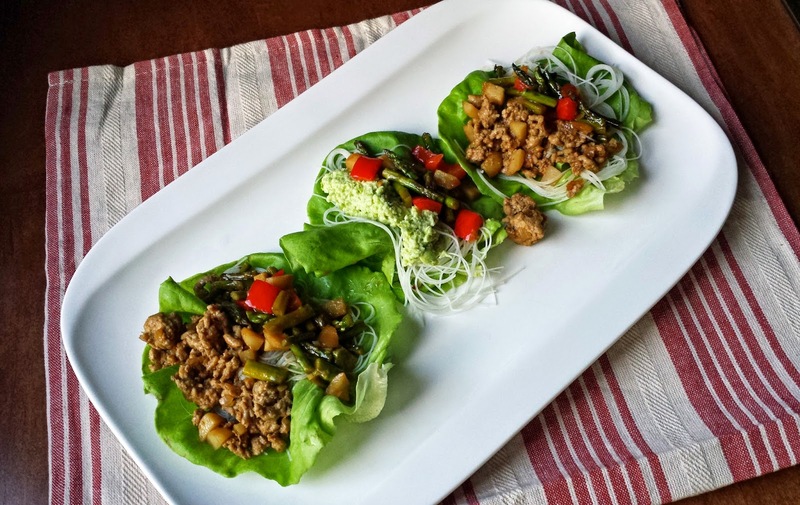 I LOVE lettuce wraps, but I have never made them myself. This has definitely got to change. I love the look of these!